On the eve of his American Invasion, Doom sends a message to his Ministers explaining that their main goal is to cut off the Senate and take over the White House. He instructs Sharp-Blue to warn her troops that super humans such as Spider-Man, Hulk, and others may interfere. As the fleet departs, Fortune receives a warning from Doom that should she betray him again, she is only a gunshot away. Aboard the Libera Cielo, Indigo Eshun preps the Cyberdive Cadre, the first organized team of Netgliders. Observing the Cadre as they enter Cyberspace is Paloma and Wire. Wire asks her why she has changed the properties of Cyberspace; now when a glider's archetype reaches deresolution, it kills them in real space. Her answer is simply because she can. Aboard a Panther's Rage vehicle, Nkrumah prepares his troops, Xandra is among them. Also prepping aboard the Holy Spook are the Guild Mercenaries under Sharp Blue's command. Finally the Libera Cielo appears above the White House and Doom's forces attack. Local C-space is locked up be Indigo's cadre, while the Guild Mercs launch an aerial campaign. Doom appears on television and announces he is claiming the presidency for himself. He restores the powers of the President as laid out in the Constitution. While Panther's Rage and Guild Mercs wage a massive land campaign, Doom informs the people of the creation of SHIELD, a merger of all paid police forces. Their first task is to arrest the heads of all Megacorps. Doom finally descends upon the White House and informs Nkrumah that he will take care of the White House himself. Shortly after, Doom is in the Oval Office. Having made his way through leaving a path laden with bodies, the last one is the president who surprises him by bravely taking his own life. Doom stands beside his still smoking corpse. Guarding the White House are the 'American Captains', whose name and appearance evoke Captain America. 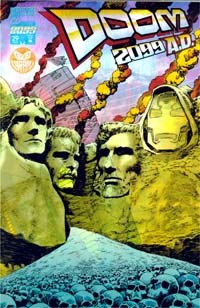 Doom has taken over the United States (and the world) a few times before. 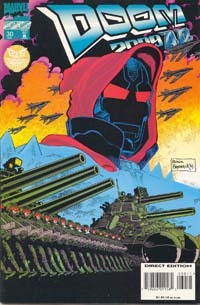 Notably in the graphic novel, Emperor Doom and in Super-Villain Team-Up 14 / Champions 16 . On both occasions Doom takes up residence in the White House. Following his coup, Doom makes drastic changes to American life. He begins construction of public dive booths, giving C-space access to everyone. He also founds CYNEX, a national news broadcasting company. Indigo calls him regarding the sudden change that they can die in C-space. Doom gives her permission to question Wire about this. He then proceeds to a meeting with the heads of the Megacorps. They're gathered together in the White House by Jake Gallows, Minister of Punishment. The Megacorp leaders are told that all their companies are nationalized. Any assets left in their Black Card accounts are considered 'gifts' to the government. All their companies will contribute to the construction of the EMPs under government contract. He warns them that their acts upon the American people will have consequences. As a demonstration, he will kill one person in the room, and they get to choose who. Outside the White House, another sort of demonstration unfolds as Thorites set themselves ablaze in protest over Doom's rule. Meanwhile in Hellrock, Sharp Blue struggles to find a way to save Hell Rock without destroying it. In the Signal Pit of the Libera Cielo, Wire sits alone after learning that Xandra was a casualty in the attack on the White House. Finally, in the White House, the corporate heads vote to kill Avatarr. Avatarr chides Doom, claiming that we can't kill him. Doom then blasts a hole through his eye. Appearances by CEO's of MegaCorps which have appeared in other titles: Avatarr, Tyler Stone, etc. Pat Broderick's last issue as interior artist. After shooting Avatarr, Doom scans the wound and discovers that he is in fact an alien unlike any alien Doom has encountered before. Avatarr spits on Doom with a hallucinogenic acid. His body also shows the ability to regenerate into new shapes. After Doom cuts into his torso, sharp spikes grow out of the wound and break through the eye slits in Doom's mask. Doom begins to feel the effects of the hallucinogenic acid and everything around him turns into a kaleidoscope of colors. Avatarr strikes Doom down, apparently for good. But as Avatarr attempts to take control of the situation and claim leadership for himself, Doom rises and deals a fatal blow. He then proceed to pound Avatarr into a (green) bloody pulp. Seething with drug induced anger, Doom proceeds to address the nation and puts Avatarr's corpse on live television. He points the blame for a decade of America's misery under the Megacorps at the people and orders a tithe for restitution. He also increases marshal law. Finally he passes out. In the days that follow, Doom implements change. Dive booths are built on every corner giving the free online access he promised. EMPs are launched thereby cleaning the environment. Outside the Oval Office, Indigo ponders on how to tell Doom that his address has trashed his credibility with the people. Morphine points out that while everyone is concerned over the address and Doom's image, he has increased marshal law. His question is did the alien blood drive him crazy, or remove the facade? Within the neutral zone of Chicago is the Reserve. A place where CEOs like Tyler Stone meet with one another. Herod, the keeper of the Reserve calls a meeting to discuss taking America back from Doom. 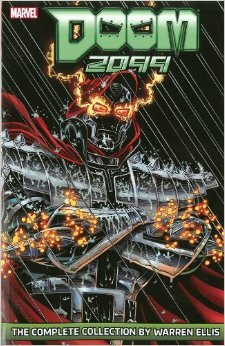 In Latveria Fortune communicates with a team looking for survivors in Necro-toxified Makhelastan. They report that there is nothing left alive. Aboard the Libera Cielo, Indigo strolls through Cyberspace and finds that something is being hidden in Chicago, and is surprised to find that all the Mega-Corps seem to be working together to keep it hidden. In the Oval Office, Doom reviews a popular biography of Captain America and finds it filled with errors. The public is turning to Cap as a pure American icon. Back in the Reserve, Herod makes an offer to the CEOs. In exchange for getting rid of Doom he asks that he rule America. His plan is to strip the Earth of all its resources and relocated to Mars. Then go somewhere else and do it again. The CEOs ask what if they refuse. Herod explains that he'll kill them if they don't agree. With little choice, they agree. Back in Washington, Sharp Blue discovers Wire's dead body with a self inflicted wound. The name Xandra is written on the wall with his own blood. At the same time, Indigo calls Doom with news that something terrible has happened in California. 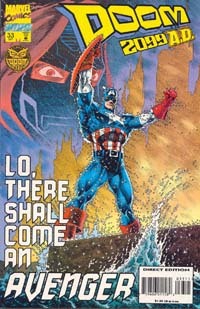 Captain America's holographic biography is written by Jack King. Probably a sly nod to Jack "The King" Kirby who co-created the character with Joe Simon. 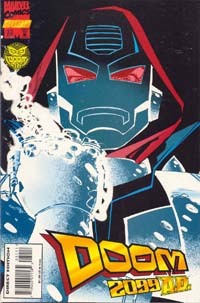 An earthquake hits California and Doom tries to manage the crisis. News of the earthquake is suddenly interrupted by a transmission showing a Alchemax R&D vessel returning from the arctic with a mysterious cargo. Emerging from the ship is Captain America. Cap claims to have been frozen in ice following a climactic final battle with Doom. Upon hearing this Doom orders the broadcast to be killed but finds that his control has been cut off. Indigo dives into cyberspace to try and get it back. To her surprise, access to cyberspace has also been blocked. Together with Doom, they fly down to the White House to try a different connection. Suddenly missiles strike the Libera Cielo and the city crashes into the capital building. Organically grown bio-weapons called Wave Spiders appear in the skies above Latveria and attack. 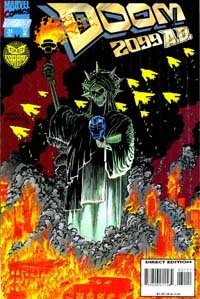 Firing deadly necro-toxins, Doom watches from the White House as Herod broadcasts the mass murder of his people. Finally a wave-spider appears over the crumbling White House and finishes the destruction by blasting its remains with Doom and his staff inside. "I'd intended to reveal Vox as dead, and Fortune as the horribly scarred last survivor of Latveria."